Millstreet (Sráid an Mhuilinn) (pop 1,500), on the border between the old baronies of Duhallow and Muskerry, is a pretty little town of C18th origin. Its main claim to fame is as the venue for the 1993 Eurovision Song Contest, from which moment in the spotlight the town has yet to recover. It also hosts Horse Shows and fairs each March and September, when the town relives the old fair-days of wheeling and dealing. 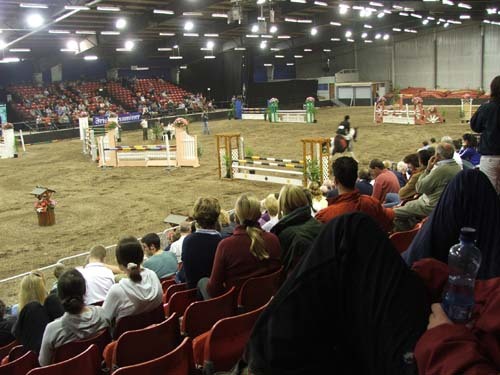 The Green Glens Arena is a major international Equestrian Centre, with modern outdoor and indoor facilities that are also used for regional entertainment / sporting events such as concerts (e.g. Dolly Parton, Willie Nelson), WBO boxing matches and, in 2006, the World Juggling Championships. The Carnegie Hall (1910) near the Town Park houses a Library, Court and Tourist Information point and the Millstreet Museum, well worth a visit in its own right, and the starting point for self-guided walking tours of the town. The building is currently (2008) undergoing renovation. The War of Independence had a major impact on Millstreet. In February 1921 a local man was the first IRA activist to be shot by firing squad. On 2nd March 1921, 13 British soldiers were killed and fifteen wounded when landmines exploded under their lorry. The Wallis Arms is a hostelry (named after the town’s principal former landlords) in Millstreet’s main square, with good drinking, eating and accomodation facilities. Millstreet Raiway Station (1853), about a mile from the town, was considerably upgraded for the Eurovision Song Contest 1993. Coolclough Church (1833) is a Gothic extravaganza created by a local sculptor, Charles O’ Connell: other creations of his can be seen in the surrounding area. Drishane Castle, built by the MacCarthy Clan between 1436 and 1450, is situated on the southern bank of the River Finnow, on a limestone rock that has been a focal point of local history and folklore since pre-Christian times. The castle has a prominent tower, commanding a beautiful view of the nearby mountains. The Sisters of Infant Jesus ran the castle as a boarding school for girls from 1909 to 1992. Other castles in the vicinity include C16th Dromsicane and C19th Duarigle (which once belonged to a daughter of the O’Callaghans of Kanturk called Madame Halikiopolos). The surrounding area is very scenic and full of interesting sites, especially along the direct road to Macroom. Millstreet is linked by a scenic road via Ballydaly to Rathmore (Co. Kerry) on ByRoute 5. Twin-peaked Caherbarnagh (Cathair Bhearnach – “the gapped fort”) (681m / 668m) in the Derrynasaggart Mountains is celebrated in song and legend; the reason is most obvious in late summer, when the purple heather clothing its slopes give the mountain a truly majestic air. Bridget Horan O’Mahony (b. 1919), author of Pagan Dances at Caherbarnagh (2001, Seattle USA), about her childhood on an isolated farm, describes the outdoor concrete platform by Caherbarnagh Lake where young parishioners used to meet on Sunday evenings. Theirs was no ordinary kind of dancing, but a frenetic square that had its roots in the French Quadrille, developed by soldiers returning from the Napoleonic wars. According to her account, this was a pagan celebration of the full moon, Bealtaine, Samhain and the solstices. The Festival of Lughnasa by Máire McNeill (2008) details the assembly which took place on the mountain on Latiaran Sunday / Domhnach Chrom Dubh in Late July. An Irish Times article about walking on Caherbarnagh can be read here. Mount Leader House, long the residence of the Leader family, descended from Cromwellian adventurers and prominent in late C18th Dublin society, who had extensive land and mining interests locally. The hilltop house is now in ruins, its grounds converted into an Industrial Estate. The old Gatehouse is a landmark on the Munster Way walking trail. Millstreet Country Park takes in over 500 acres of lakes, waterfalls, streams, wetlands, moorlands, herb rich meadows, an arboretum, ornamental and themed gardens (sensory, music, bees etc. ), a large herd of red deer, several Stone Circles and other megaliths. Mushera Mountain features a steep 1.5 km walk to the summit, and the ancient Saint John’s Well, scene of special annual celebrations on 24th June dedicated to Saint John of Mushera, the local incarnation of St. John the Baptist. The park can be explores on open-sided vehicles driven by friendly local guides, providing access to all areas. Kilmeedy Bridge was a traditional gathering point for socialising and merry-making in times past. Kilmeedy Lodge Animal Sanctuary is a welfare facility for horses, ponies, donkeys, sheep, goats, pigs, dogs, cats, peacocks, ducks, chickens and other animals, privately run by Sue Graham, who has a shop selling a range of beads and materials for craftwork. Kilmeedy Castle (1436), built to guard the mountain pass between Counties Cork and Kerry, was severely damaged by Cromwellian troops in 1652. Bealac Mountain Pass leads to Cumeenatrush Lake, where a 2000-year-old dugout canoe found in 1993 is now displayed on the shore. Carriganimmy /Carriganima (Carraig an Ime) is a quiet village located between the Derrynasaggart and the Boggeragh mountain ranges, in the valley of the Foherish River, a tributary of the River Sullane. This is part of the ancestral O’Keeffe homeland. The area is famous for its concentration of Neolithic/Bronze age archaeological sites such as wedge tombs, cairns, radial stone cairns, Standing Stones, Stone Rows, Stone Circles and fulachta fiadh. Airt Ó Laoghaire / Art O’Leary (b.1746) was a hot-tempered officer in the Austrian army. Returning home to Rathleigh House near Macroom, Art, a Roman Catholic, flouted the Penal Laws by refusing to sell his prize-winning horse to a Protestant, Abraham Morris, and thus became an outlaw. Morris tracked him down and shot him dead near Carriganimmy on 4th May 1773. Art’s wife Eileen / Eibhlín “Dhubh” Ní Chonnaill (aunt of Daniel O’Connell) composed the acclaimed masterpiece Caoineadh Airt Uí Laoghaire / Lament for Art O’Leary, mourning his death and crying for revenge. Carriganimmy was the location of a Whiteboy ambush on the Tralee Mail Coach in January 1822. The troops sent to deal with the outlaws famously returned carrying the near-naked corpses of several very young men, and imprisoned 29 scantily clad adolescents in Macroom Castle, of whom nine were afterwards hanged. Carriganimmy marks a stage of the Beara-Breifne Greenway walking route, based on the historic O’Sullivan Beara march from Dunboy to Leitrim in January 1603. Carriganimmy is within easy reach of Ballingree and Aghabullogue on ByRoute 3. Clondrohid (Cluain Droichid) was the scene of a Whiteboy / Rockite incident in January 1822; one insurgent was killed and several wounded during the course of a raid on the local Glebe House, residence of the Rev. Robert Kirchhoffer.